Features: PILOT POINT tip starts on contact for clean accurate holes and reduces lock-up on breakthrough No-Spin shank eliminates the frustration of bit spinning in the chuck Tapered web provides greater durability to reduce breaking Size markings are located above the shank to prevent them from wearing away DW1904 1/16" Split Point drill bit DW1905 5/64" Split.. Product Features Compact, lightweight design fits into tight areas High speed transmission delivers 2 speeds (0-600 & 0-2,000 rpm) for a range of fastening and drilling applications Ergonomic Handle delivers comfort and control Heavy-duty1/2" ratcheting chuck with carbide inserts provides superior bit gripping strength Voltage 20V MAX* Max Power 350UWO # of Speed ..
DeWALT is a leading manufacturer of industrial power tools with more than 300 power tool and equipment products as well as 800 power tool accessories. 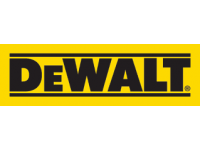 DeWALT tools can be found wherever tools are sold, nationally and internationally. DeWALT DW2222 5/16" X 2-9/16" Magnetic Socket Driver Features: 5/16" x 2-9/16" Magnetic Nut Driver Patented geometry reduces rounding..
DeWALT DW2542 3/8" Rapid Load Socket Adaptor Features: Fast and efficient way to switch screw driving to hole drillingCrafted from hardened steel for strength and durability Easily adapts sockets for use in drills 5/16" x 2-9/16" Magnetic Nut Driver ..